Speed and precision are the name of the game. Stop fumbling with scissors, or resorting to ripping. This simple but useful tool will make it easy to quickly remove coupons from newspapers and magazines. You will never have to deal with the jagged edge that scissors make or missing parts due to tearing them out by hand. You will also avoid other common annoyances like partially ripped bar codes or trying to cut into the crease or binding. Gone will be the days of spending hours removing coupons as you begin to spend less time, and achieve better results. Each edge will be perfectly straight, and you will all but eliminate the possibility of damage. This will make them easier to sort and store, but also provide a level of accuracy that will make it nearly impossible to rip or ruin a discount on accident. Stop taking the whole morning on Sundays to clip your coupons and start powering through them with more speed and accuracy than ever before. Cutting out coupons or anything else is fast and easy when you use this tool. For easiest use, place it flat on a table or counter top. It is the perfect size to span the full width of your standard coupon insert, so removing any size or amount is simple and efficient. To use it, simply lay flat over the top of the sheet you intend to cut from. Line up the cutting edge so that it is flush with the edge of the coupon you want to cut out. Then just press down on the Q-Pon Cutter, and pull the paper towards you. The unique cutting edge will quickly and accurately slice through the paper to reveal a clean edge that is perfectly straight. With handy measuring units on the side, you can also use this compact cutter to measure before you cut. Just fold the top edge of the paper down to measure the length, and it will show you the exact size of the piece you will cut. The Q-Pon Cutter will allow you to cut exactly the size you want and do it with unmatched precision. No more jagged, torn or diagonally cut edges. This tool will cut straight every time. This inexpensive tool will work faster than scissors and your results will look better too. Get it to quickly cut out coupons, but use it for other small projects as well. You can use it to make homemade greeting cards, recipe cards, for scrap booking and other crafts, wrapping gifts and so much more. Any time you need to cut something small from a larger piece of paper, and you need it to have clean, straight edges, this tool will make the job easier. Measure and cut with one convenient and compact tool. 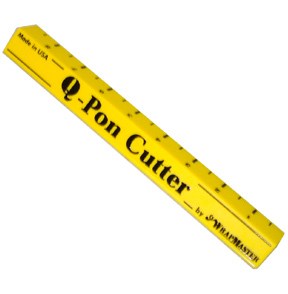 Cut a precisely, straight line everytime with the Q-Pon cutter. Order Yours Today! Q-Pon Cutter - For fast and accurate cutting. Measure and cut with one easy-to-use tool. Get professional results every time. Great for coupons, but can be used for so much more. Order yours Today! It is very handy and easy to use. Nice size to work with.